First of all, big shoutout to my crew for being amazing. Seriously, great crew. We all work well together. And we've had plenty of meaningful conversations peppered with bouts of laughter. Just what this ENFP loves in a crew :) We had a long layover in San Antonio (SAT), so we decided to explore the Riverwalk and surrounding downtown area. 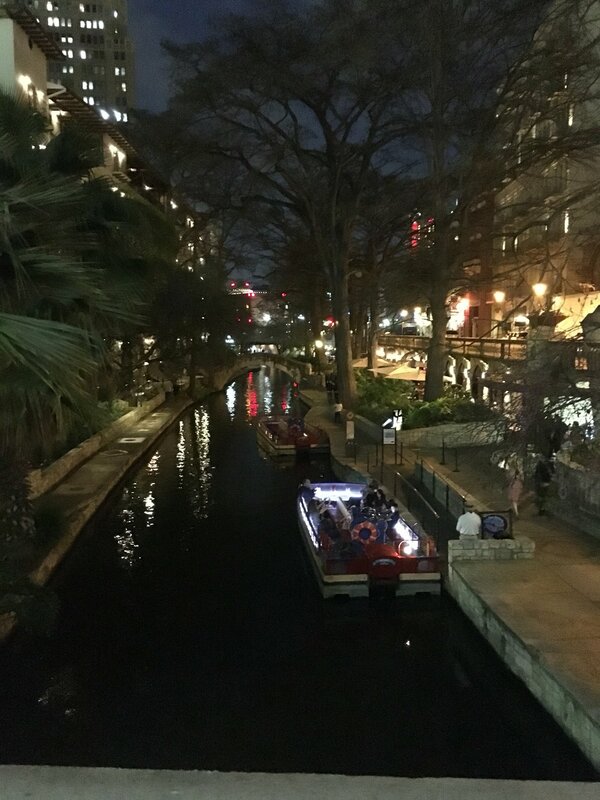 The Riverwalk is a nice area that goes through the heart of San Antonio. And it's a lovely leisurely walk surrounded by shops and restaurants. We took advantage of the lovely weather (25°C/76°F) and walked a good bit of the Riverwalk. Now, it is touristy. Quite touristy. And usually I stay away from touristy spots, but I made an exception for the Riverwalk because it was a nice day. Before leaving the hotel, we asked the front desk associate for restaurant recommendations. We wanted authentic Tex-Mex or Mexican food. The associate told us to try Ma Tierra in Market Square and Iron Cactus on the Riverwalk. So, we're thinking that because the front desk associate was local, she would give some good recommendations. Market Square is very touristy. All of the shops sold tchotchkes, t-shirts, cowboy hats, and jewelry. And Ma Tierra was not worth the price we paid. The food was forgettable - something that I could've gotten at home for a lot less. We left Ma Tierra feeling less than satisfied. Market Square is kinda pretty, though. For dinner, we went to the Iron Cactus on the Riverwalk. Again, forgettable food. The ambiance was kinda cool because it's right on the river. BUT there are plenty of birds that know that tourists will either feed them (like the lady at the table near us ?) or drop food. There were birds everywhere. And they get really close because they're obviously used to people. We did visit the Alamo, which was cool. And a few beautiful cathedrals in the city.